"Nossa missão é desenvolver a mentalidade marítima e incentivar o esporte da vela." Carioca and sailor since childhood, Guruga started his sailing career at age 14. He has an outstanding track record in sailing that includes regional, national and world championships and Olympic Games participation in the Seoul and Barcelona. 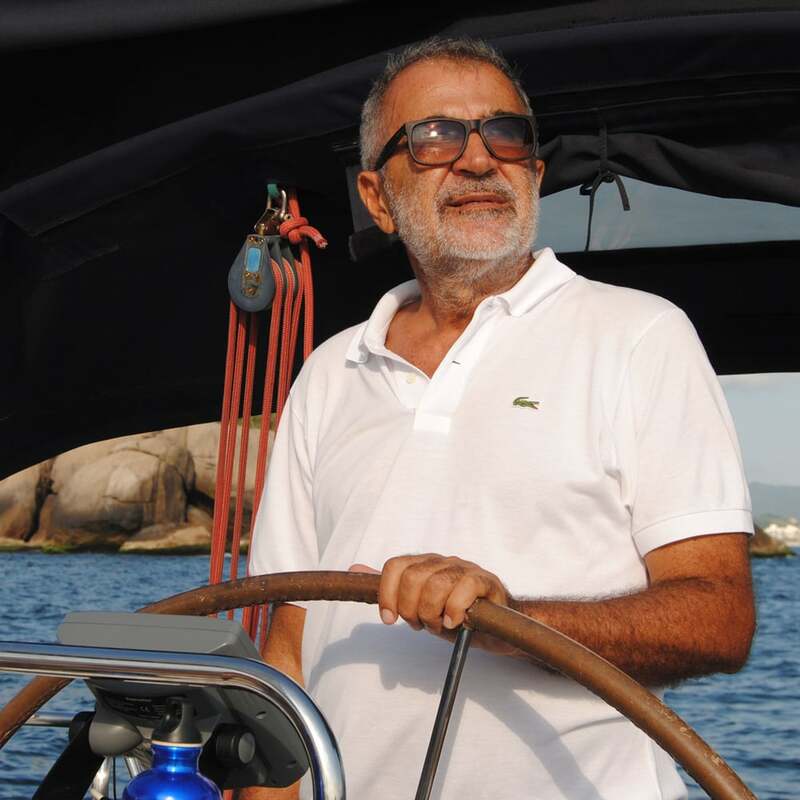 He was a student , professor and director of the Nautical Sports School of Yacht Club of Rio de Janeiro and coach of the current male Olympic team of 470 class. Captain Amateur and rescue diver with PADI certification, he is also sports manager formed by the COB / CAGE 2013/14. He is also engaged in social work through the Instituto Rumo ao Mar with the aim of developing the maritime mentality. Com 23 anos, Muriel é designer de produto e veleja desde pequena. Já foi Campeã brasileira de HPE com a equipe Del Priore Sailing Team, e possui carteira de arrais amadora. É também certificada pela PADI, a maior organização de treinamento em mergulho de scuba, e possui certificação de socorrista. He leverages the weekends and the breaches of the day-to-day corporate communications consultant. It just takes good wind conditions and company for him to raise the Grahadhara sailes and enjoy the sunset, toast to nature and marvel at the astonishing views of Guanabara Bay and the coast of Rio de Janeiro. He sails since 1980, when it started in windsurfing and laser classes. The passion for the sea also led him to practice diving and defend the preservation and recovery of marine life. He believes that the best way to preserve a vessel and return the joys it brings is to let it fulfill its destiny, letting it loose from the pier and go sailing whenever possible. So he shares with satisfaction his boat with people who love the sea and navigation. Its mission is to rescue and raise awareness over the use of river water and Brazilian offshore jurisdiction of the so-called " Blue Amazon" for the country's sustainable development through actions and social, educational and cultural projects and environmental preservation.